More horror than sci-fi really with a new human species of telepaths with the ability to move objects, read peoples' minds, set things afire and, most spectacularly, make people's heads explode! In the film a "good" scanner helps some doctors track down a "bad" one. Canadian director David Cronenberg (who has a thing for vile and weird body parts - witness movies like The Fly and Naked Lunch) directs what is most likely to be remembered for its graphic scenes of exploding human heads and little else. Definitely not the at times directionless plot which also involves all kinds of murky going-ons and corruption in high places. 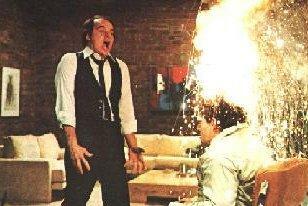 Ultimately it is really difficult to care about the storyline and/or the characters in Scanners. Followed by numerous sequels with which Cronenberg wasn't involved at all: Scanners II: The New Order (1991), Scanners III: The Take Over (1992) and Scanners: The Showdown (1994, also known as Scanner Cop II: Volkin's Revenge for some reason).